Of course, I still want my physical version of whatever that is and preferably in a nice box with quality artwork. Very thorough analysis! A very nice read, too. You have an advantage over a lot of developers in that you can recognize your mistakes and learn from them. Ealdorlight may not have worked quite the way you wanted it to, but I'm confident your next attempt will be a success. I think you might be right, Silver. I read, and replied to, your comments earlier, Chris. As others here have said, I hope you will (and can continue to) create new games. I think you're bringing a novel and extremely valuable perspective to computer games, and I hope there's a way you can continue to work on your ideas. I'm sure, Chris will find anything you care to contribute worthy of his attention. I believe your financial and moral support have also mattered, Victor. I've been part of a Kickstarter that didn't make it. "Disappointed" doesn't describe the feeling. But knowing that there are still people who believe in the ideas, and who are willing to invest more faith -- and, perhaps, coin -- in a more focused attempt to realize some of those ideas... maybe it's enough. For your mixture of kind and thought-provoking words, I thank you, Flat. For the smiles produced by your contribution, I'm grateful, Cornflakes. 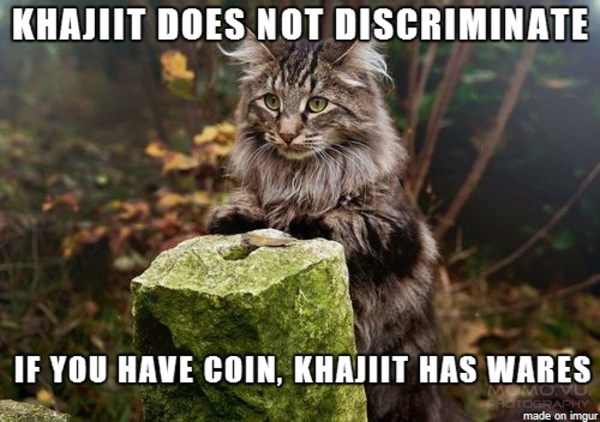 I'm not sure if Chris has had dealings with the Khajiit but they always seem to have items for sale which I find irresistible. I, for one, am not disinterested in moar Sol Trader updates.